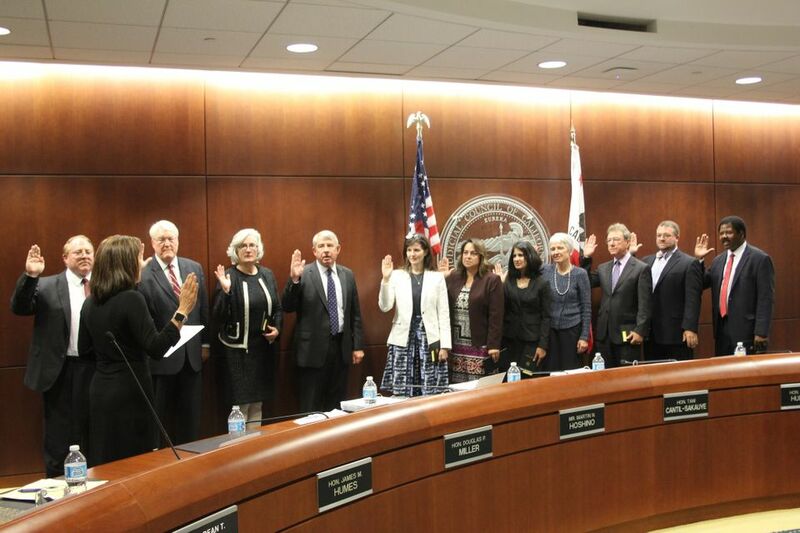 (San Francisco) Chief Justice Tani G. Cantil-Sakauye administers the oath to incoming council members. Learn more about recent appointments. L-R: Michael M. Roddy, Superior Court of San Diego County; Judge Harold W. Hopp, Superior Court of Riverside County; Attorney Gretchen M. Nelson; Justice Harry Hull (reappointment), Court of Appeal, Third Appellate District; Attorney Rachel Hill; Clerk/Executive Officer Andrea K. Wallin-Rohmann, Court of Appeal, Third Appellate District; Commissioner Shama Hakim Mesiwala, Superior Court of Sacramento County; Presiding Judge Patricia Lucas, Superior Court of Santa Clara County; Judge Stuart Rice, Superior Court of Los Angeles County; Presiding Judge C. Todd Bottke (reappointment), Superior Court of Tehama County; and Judge Kevin Brazile, Superior Court of Los Angeles County. Bios of all council members are available here.